On occasion we do take in rescues. Many times people get there gerbabies from petstores who are already pregnant(unknowingly). They come home with there new baby and days, or even weeks later they give birth unexpectedly. And sometimes it can be hard to find them a new home. Or sometimes people have family or health issues and need to rehome there pets, ect.. Sometimes if this happens, we will take there babies in and rehome them in a new loving home(when and if they are ready) where they will continue to be loved. 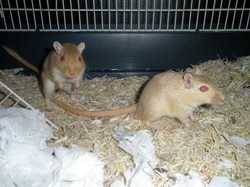 We just want to make sure all Gerbils out there are in a loving caring home where they live a long happy life. If you, or someone you know is in need of rescue help, please contact us and we can discuss the situation and try to help out as best we can! Want to adopt a rescue? Please contact us if you are interested in adopting a rescue gerbaby. If there are no rescues available at that time you can be put onto our rescue waiting list. Just email us and let us know you want to be on the list. We currently do no thave any rescues ready for homes. Keep checking back for any updates!